Johannes Gutenberg introduced the printing press to Europe in the 1400s, and revolutionized publishing. 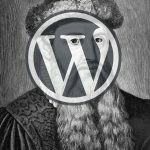 WordPress powers over 30% of the world’s websites, and its developers aim to use Gutenberg as a revolutionary way to develop content. We wanted to give our clients a heads up, plus compare the new user interface to the powerful Divi them with its own content builder, so here you can review a video with Scott Frangos, Chief Optimizer for Webdirexion. 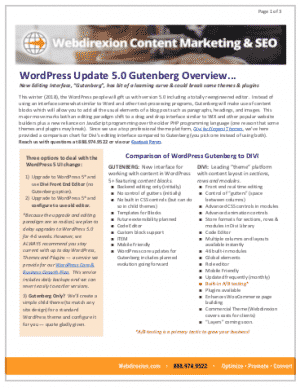 Above, the standard content blocks for the initial release of Gutenberg are shown. What’s next for Gutenberg and WordPress? 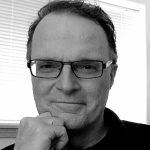 According to the lead developers of WordPress, “Phase 2 is about thinking outside the box, namely the post and page box, to allow Gutenberg to handle entire-site layouts. We will replace widgets with blocks, so any block will be able to be used in any registered “sidebar” for legacy themes, and we will upgrade “menus” to a navigation block.” The WordPress people are ambitious… and how lucky are we to get this wonderful program for free? We wanted our clients and followers to get ready for the WordPress 5 Gutenberg new editing experience plus compare Gutenberg to our theme of choice with its own content builder — Divi — so we’ve prepared an overview video, plus a comparison guide with Frequently Asked Questions. Send for our Guide at right. Learn the new WordPress 5 Gutenberg concept of content "blocks", and compare page layout with the new editor to page building with the powerful Divi platform. 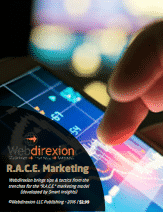 Watch for more page layout and content strategy tutorials from Webdirexion soon.